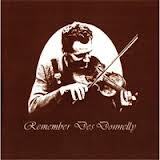 A look at albums we have written about in 2013 – here’s the late Des Donnelly and his 2013 remastered ‘Remember Des Donnelly’ taken from Irish Music Magazine. There’s character in the sweep of the bow that ignites the strings in the seventeen re–mastered tracks of the playing of the late Des Donnelly who tragically passed away at the young age of 40 in 1973.The Fintona native who settled in Manchester in the North of England fired the Irish scene there with his passion for playing and in doing so ensured that his inimitable style would be passed through the Donnelly generations and extend to the network of budding players who were enticed by his musicianship. In fact you can hear it through his version of the hornpipes The Star and The Sunshine where the ability to lift the tune out of the fiddle so it echoes around the room and bursts into a dance can now be heard in the style of younger fiddle players everywhere. I have to confess I have listened to this album before many years ago when it was released on vinyl. Where it is now; I don’t know, but as his 40th anniversary appears on the horizon I am delighted that his family have decided to release it on CD as his vitality and flair for the unexpected made him one of the most exciting players of his time and it is right that everyone should get a chance to experience that. Listen to his version of Last Night’s Fun or The Spey in a Spate and you’ll see what I mean. This album is must on all levels. Enjoyment can be found in the style and delivery and the passion for the music and as well as that, it documents a period in time that was vitally important to the legacy of Irish music outside the island of Ireland. Through his incomparable style of play, the magic of Des Donnelly undoubtedly leaves us with a historical treasure trove of gold.